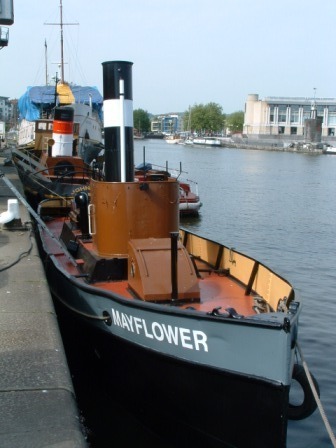 MAYFLOWER was built of iron in 1861 by Stothert & Marten, of Hotwells, Bristol, for Timothy Hadley, a towage contractor to the Gloucester & Berkeley Canal Co. She had a single-cylinder vertical steam engine, and began work towing small sailing vessels, timber rafts and canal and river boats on the canal, working between Gloucester and the old entrance to the canal north of Sharpness, replacing horses in this task. 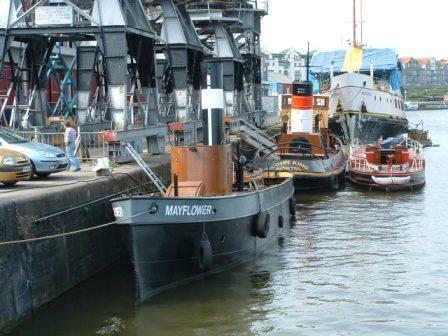 In 1874, with the building of the Sharpness Docks, the canal company was renamed the Sharpness New Docks & Gloucester & Birmingham Navigation Co., and purchased the MAYFLOWER and other tugs from Hadley. 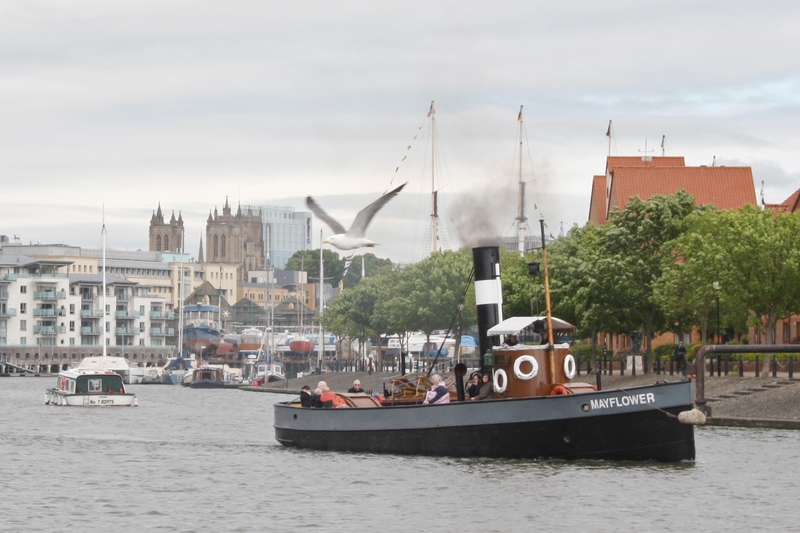 She continued to work on the canal, now working with larger steam ships that could navigate to Gloucester, or with lighters filled by the larger traffic into Sharpness. In 1899, her vertical single-cylinder steam engine was replaced by a vertical compound condensing engine, and a sheltered steering position was provided to fit her for use on the Bristol Channel. 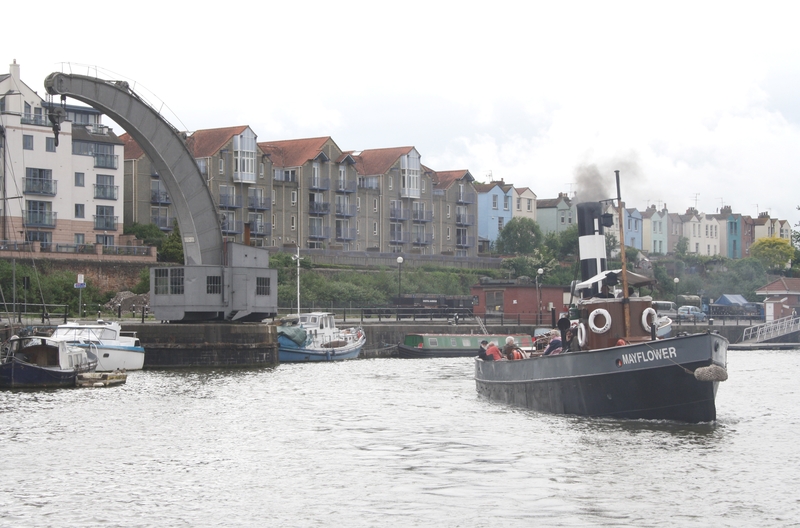 Her funnel was hinged in 1906 to permit passage under bridges on the non-tidal Severn up to Worcester. 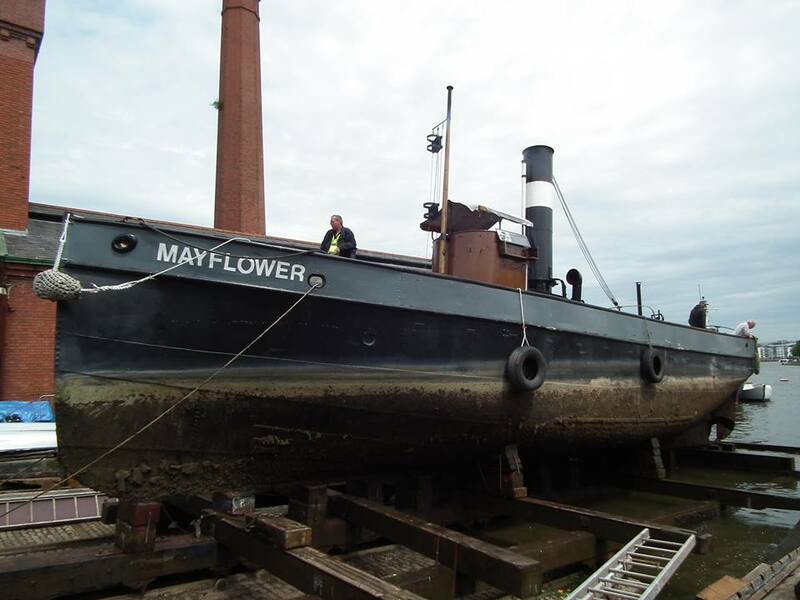 With this wide versatility, MAYFLOWER frequently served as the training tug in the Company’s fleet. Originally, she had a steering position astern of the engine-room skylight, so that the skipper could operate the engine via long levers as well as steer: this had been replaced by a waist-height steering shelter forward of the funnel. When her deck was raised in 1922, most of her bulwarks were cut away along each side and replaced by stanchions and chains, enabling her crew to step safely across to laden barges on the Canal. Late in the 1930s, a wooden wheelhouse replaced the steering shelter and some time later, the bulwarks were replaced. 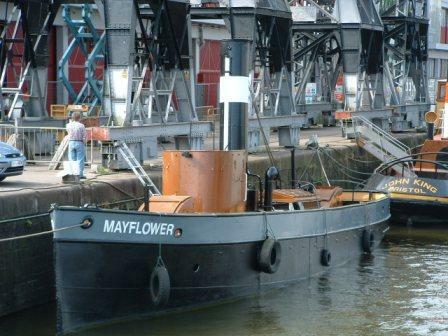 By the end of the Second World War, MAYFLOWER had been relegated to the light duties, and spent most of the war period as a tender to the canal dredger, towing the mud hopper barges filled by the dredger to the discharge point. 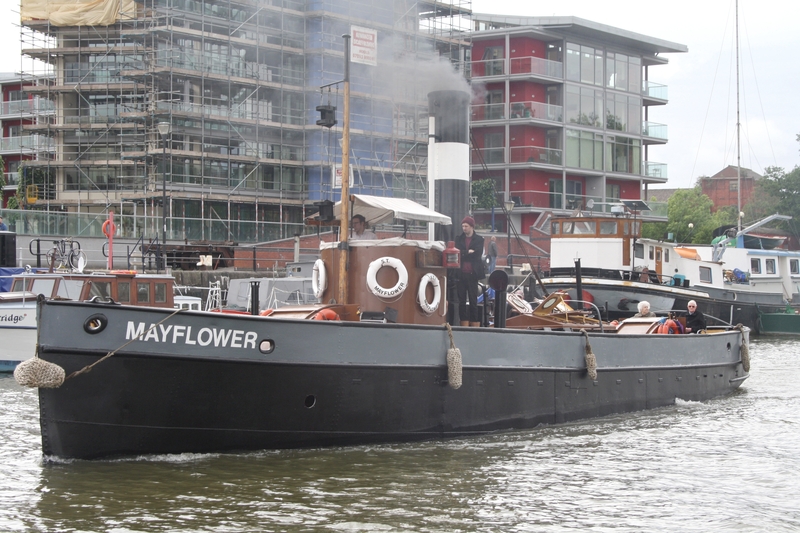 In 1948, she was passed to the British Waterways Board and retained as a reserve vessel for busy periods. 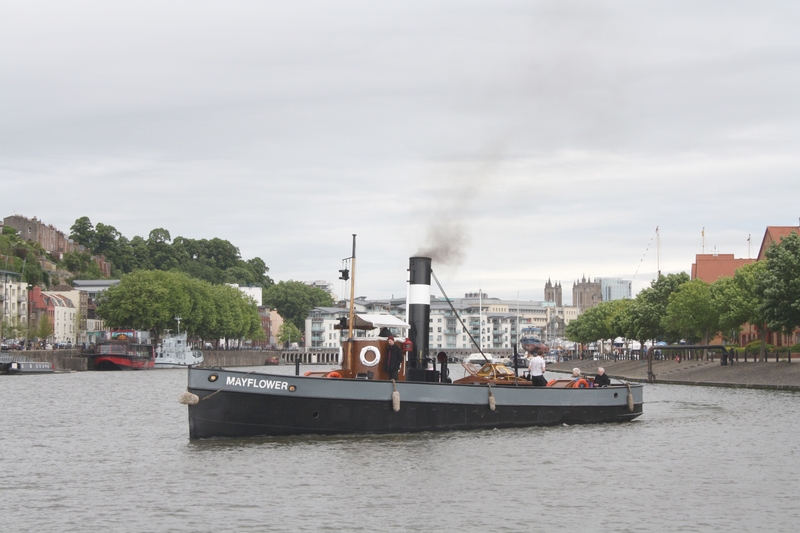 She continued in steam whilst her sister tugs were motorised. 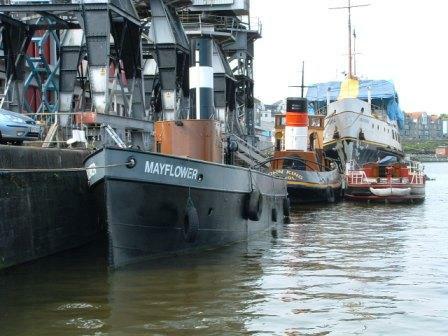 In the winter of 1962/63, the canal froze and MAYFLOWER was once again used for ship towage on the canal. This was her swansong, for in 1964, she was laid up and was sold two years later. She lay neglected and, in 1977, sank in Gloucester Docks. 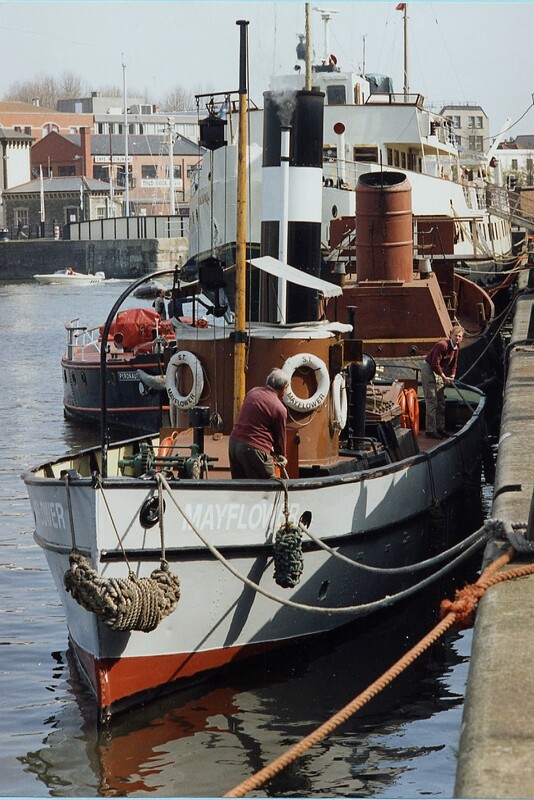 She was refloated and was sold in 1981 to Bristol Industrial Museum for restoration to steaming condition, which was completed by 1987. She was the winner of the Steam Heritage Marine Award in 1988 and the Scania Transport Trust Marine Award in 1989. 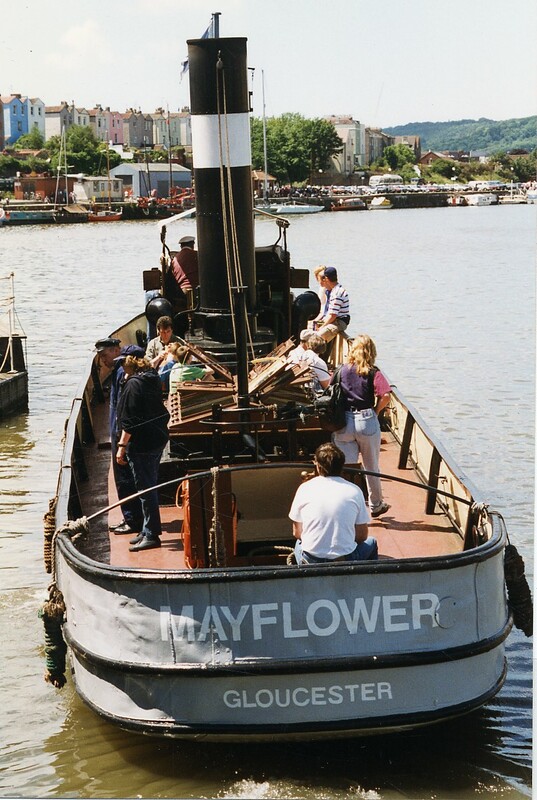 Since then, MAYFLOWER has been exhibited outside the museum and has also offered trips under steam in Bristol Harbour, carrying up to twelve passengers. In 2006, the Industrial Museum closed but she is currently undergoing maintenance and repair for her steaming for the first time publicly for over four years in May 2011 (her 150th anniversary). Source: Paul Brown, Historic Ships The Survivors (Amberley, 2010), updated March 2011 & John Robinson, Advisory Committee, March 2009.